When I met my husband six years ago, I’d lived alone for most of my adult life. My daughter was on her own and I’d been divorced for almost thirty years. I was 62 and Morgan was 68. Years before I’d “downsized” into an apartment, putting a lot of my stuff in a storage unit. Morgan still lived in the house he and his first wife had bought and renovated more than forty years before…an old stone farmhouse on several acres. After months of “dating” he “asked” me to marry him but it was several more months before he let me see the inside of his house…lots of stuff, books, antiques, collections. And that’s what I had…books, antiques, collections. How were we going to join these two lives and all the stuff? It wasn’t easy. I kept my storage unit and I decided what things I wanted with me. Some of Morgan’s things were moved into storage sheds. Some of the stuff he gave to his children. Some clothes, his and mine, are piled (mine neatly) next to our respective sides of our bed. 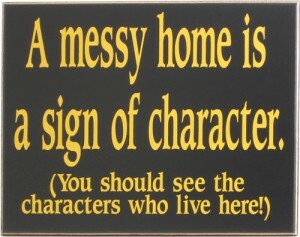 So the house is not messy as it’s full of stuff. Years of stuff from his family and years of my stuff. No piles of newspapers, no hoarder-type stacks of detritus. Just books and our collections, some displayed, some not. There are times, I must admit, that I get upset with clutter and start ranting. I did that this morning when he couldn’t find his wallet and yet, I was ultimately the one to blame for that disappearance…it was in the washer. So I reread the above blog and I realized something. It’s more important for us to maintain our health and have our interests, reading, writing, travel, than it is making sure everything is nice and neat with a place for everything and everything in its place. Living life is much more important. And when we’re gone, our kids can have fun sorting it all out.